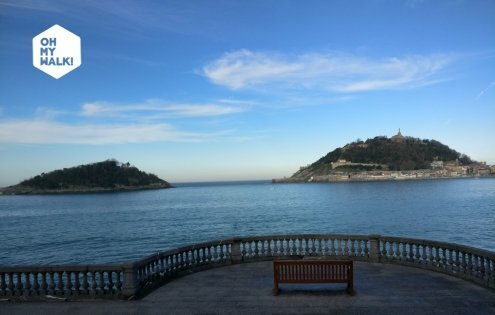 5 useful first steps when visiting San Sebastian - Oh My Walk! Making your visit even more enjoyable! These days, we tend to pack our bags, hop on a plain and visit a new city in the blink of an eye! Low cost airlines have “democratised” travel, making movement from point A to point B by plain accessible, quick and affordable to most of us. While in a not so distant past, international trips were considered an unaffordable dream for many of us, today it’s as easy as throwing a few handy things in our bags and enjoying a new destination in a matter of hours! What happens when we reach our city of choice? We have no time to waste! That’s why the team at Oh My Walk! has put together five helpful tips that will make your experience a lot more enjoyable when visiting San Sebastian. Because we know you want to make the most of our gorgeous city in as little time as possible! Are you a long-haul traveller? Do you prefer to visit San Sebastian without having to hurry? These five useful first steps when visiting San Sebastian are also your point of departure while here! Straight to the tourist office! I know, it sounds a little old fashioned given the amount of information available today online, but our local tourist office abounds with very helpful suggestions about what to see and do in San Sebastian! Get a map and of the city and while you are there grab one of our brochures! 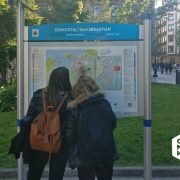 Discover our walking tours of San Sebastian and find out which of our routes best suits your interests. 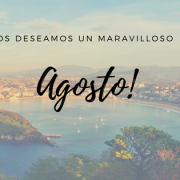 From Maritime San Sebastian to Hidden San Sebastian, Dark San Sebastian, Feminine San Sebastian, Belle Epoque San Sebastian and many other Pop-up guided routes that will have you discovering the secret history of our city for around 90 very enjoyable minutes! 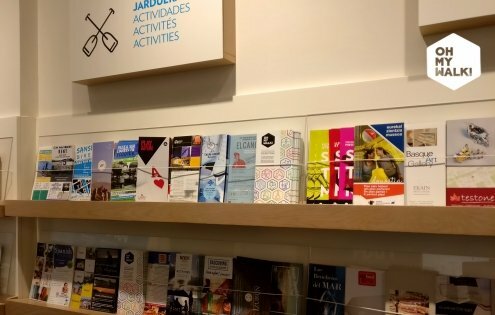 While at the tourist office, make sure to buy your San Sebastian and Basque Cards as these tourist gems will save you some serious money in transportation as well as in the main tourist attractions and services around San Sebastian. And if you are the owner of one of these tourist cards, you’ll also receive a 10% discount when booking any of our walking tours in San Sebastian! 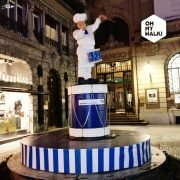 San Sebastian is not a big city but there’s plenty to see! The best way to go from A to B is taking out a transport card called MUGI. You can get at all tobacco stores for only €5 and can be easily recharged but it expires after 12 months if not recharged. Remember this if you fall in love with our city (I promise you, you will!) and plan on coming back later in the year to enjoy one of our festivals or simply to discover San Sebastian during another season. 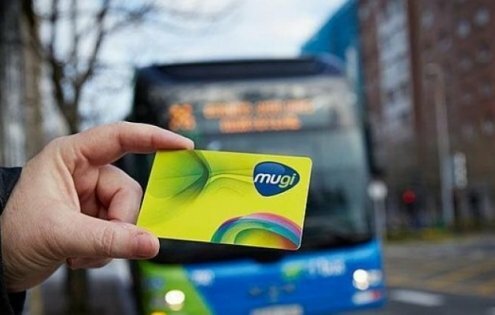 Why do we recommend you buy a MUGI Card in a smallish city like San Sebastian? Well, for starters, our transport system is not cheap. A trip on a bus in San Sebastian will cost you 1.75 € per person! Your MUGI Card reduces that cost by 32% discount and gives you the possibility to use one card for several people. It can also be used for train travel. You can find out more about San Sebastian’s travel cards here. Would you rather exercise and minimise your carbon footprint while in San Sebastian? Then, one word – DBIZI! 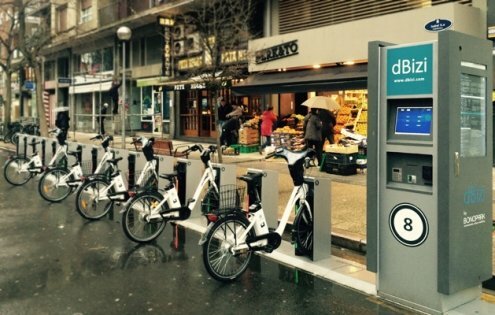 Our city-bikes offer the commodity to hop on and off at different stops around the city. All you need to do is swipe your pre-purchased card at the bike’s station and return it at another location in the city. San Sebastian is a relatively easy to pedal city with hardly any slopes, so these electric bikes are a smart and comfortable way to move around! Plus, there are plenty of bike paths marked in red for you to circulate around the city. Find out more about Dbizi here. The people of San Sebastian feel very fortunate to have stunning beaches at our doorstep! And we love to be able to share them with all our visitors! And while San Sebastian is a safe city, we like to be cautious and prevent any potential headaches from ruining your holidays. So, here is our advice: next time you visit San Sebastian and decide to spend some time sun bathing, swimming or surfing on the beach on your own, don’t leave your possessions unattended in the sand. Instead, use one of our “Collective Cabins” available in three of our main beaches – Ondarreta, Concha and Zurriola (only in summer). 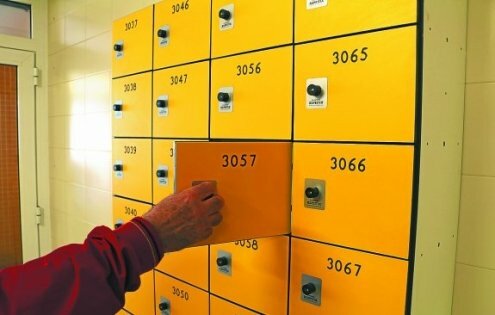 Here, you’ll be able to rent a locker and shower for only 1.5 €! Enjoy the surf and the sun comfortably and safely! Find out more about our Collective Cabins here. 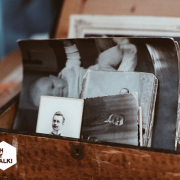 We know that the first thing most people do when travelling is leave their bags in their new home away from home and head straight for the supermarket to buy basic provisions. But, while visiting San Sebastian, we’d like to offer an alternative – fresh produce markets. You must try our locally grown food! Visiting our daily markets not only gives you the opportunity to mingle with the locals but it also allows you to buy some of the best fresh produce from our countryside. You might even come across some of the best chefs in San Sebastian doing their daily grocery shopping! There are markets every day but there might be a little hard to find for the untrained tourist eye. So, look out for La Bretxa Market in the commercial centre of the old town. You’ll love both the stunning building and the stunning display of seasonal products. You even have a supermarket. 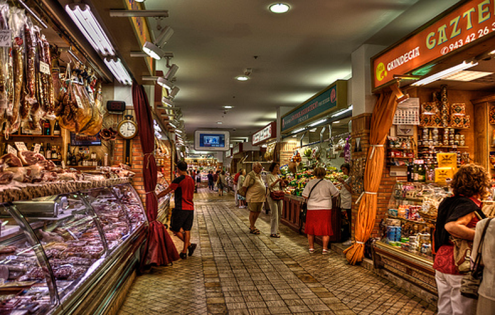 Find out more about La Bretxa Market here. And if you find yourself in the centre of the city near the cathedral, you can’t miss San Martin’s Market. 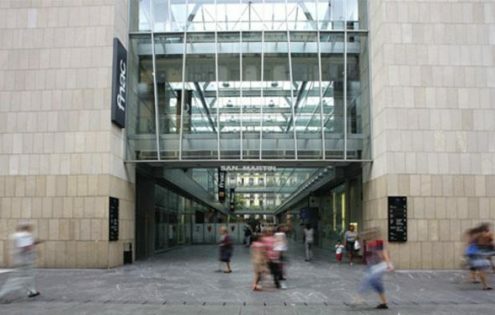 This newly refurbished building houses a stunning display of San Sebastian’s trading activity and daily life! And if you are lucky enough to visit it on a Thursday, you can’t miss the Gastropote! Enjoy free pintxos when consuming a drink in the market premises while listening to live music! Find out more about San Martin’s Market here. Once you put into practice our tips, your visit to San Sebastian will for sure be unforgetable! 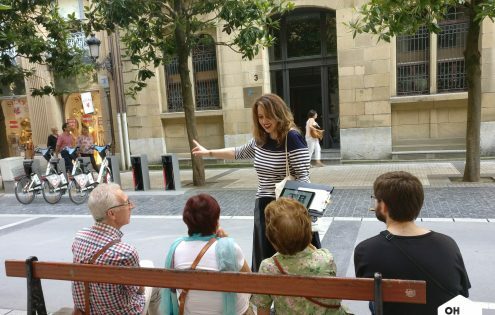 And of course, if you are the type of tourist that prefers to dig deep into the city’s social history, join us for one of our very exciting and informative walking tours of San Sebastian! 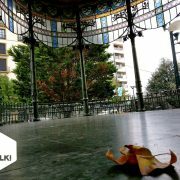 Join us in our Walking tours of San Sebastian. 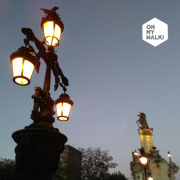 3 mayo, 2018 /0 Comentarios/por Oh My Walk! ¡Sorpresas, juegos, cultura y diversión en Familia! 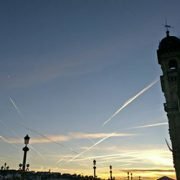 No te marches de San Sebastián sin vivir la energía mágica de estos cuatro barrios. ¡Nuestra ruta a pie “Leyendas y Mitos de San Sebastián” en Olatu Talka 2018!